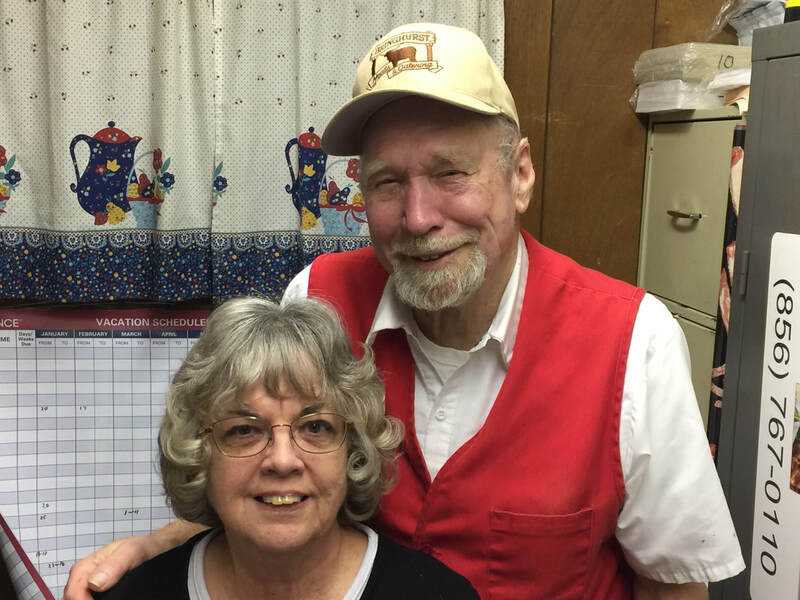 Today our spotlight is on Al and Nancy Bringhurst. Nancy is our bookkeeper; Al is our most senior butcher. Al is a 3rd generation Tansboro resident whose father and uncle founded our company in 1934. It began as a sweet potato farm, later evolving into a pig farm and butcher shop. Al started working there as a teen. He made “meat runs” to Bridgeton, Vineland, and Swedesboro, delivering pork and 400 lb. tubs of lard to stores and restaurants. ​Al was drafted into the Army in 1964. Nancy and Al stayed in touch during his service; he returned home in November of 1966 and they were married two weeks later. 1966 is also the year Nancy began working at the store. Nancy points out that - in addition to maintaining a friendly, welcoming atmosphere – that “We’re also committed to making sure everyone is pleased with what they get. We strive to satisfy the customer, which is not always the case in the world today”. Al agrees: “If something’s not right we’ll make it right”. They both appreciate being able to deliver a level of service that larger stores often can’t. Al asks “Have you ever gone to a chain store and tried to order a special roast”? In some ways Nancy and Al are opposites. Nancy is quiet and reserved, and her jokes never make you cringe. Al beats customers into submission with his friendly-but-unsparing sense of humor. (While Al writes some of his own material, he also “borrows” a lot of it. So that feeling you get after Al tells a joke is usually not his fault.) However, this dynamic duo also has a lot in common, including the joy they get from their interactions with customers… from the ones they’ve served for decades to the ones they meet for the first time. What do they do in their spare time? You might find Al immersed in Civil War history books. Nancy also likes to read, and she teaches too. She’s currently home-schooling one of her granddaughters in math via Skype! With nearly a century of company experience between them, Nancy and Al have many fascinating stories to tell, and they’re the subject of many more. They’re part of Bringhurst Meats folklore, and they help bring out the best of who we are today. Hats off to them both.